Not long before the bullets came raining down, Las Vegas police officer Charleston Hartfield posted a string of photos on Instagram and Facebook. One showed a banner from the Route 91 Harvest Festival, the country music show he attended every year. Another photo showed a deep-fried Reese's Peanut Butter Cup, and another showed him with his wife at the festival — their silly selfie faces glowing beneath the neon lights of the Vegas Strip behind them. That was all before one of those bullets struck and killed Hartfield, who was off-duty. The photos became the last memories of a happy night in a life that by all accounts shone just as brightly as those lights, dimmed by an unspeakable act of gun violence. In life, Hartfield, 34, was an Army veteran and youth football coach known by his players and their families as "Coach Chucky." In death, he became one of 58 victims cut down in the massacre, which also injured almost than 500 others at the festival in Las Vegas on Sunday night. The Route 91 Festival was a yearly tradition for Hartfield and his wife, Veronica, an emergency room nurse, friends said. They’d leave their two children with family, book a hotel near the Strip and enjoy the festivities. In the hours before the shooting, this year’s concert was more of the same. Then, a stream of gunfire. A pregnant pause, then more gunfire. A wave of terror washed through the crowd as concertgoers scrambled for safety, which was hard to find between the stage and the high fencing. 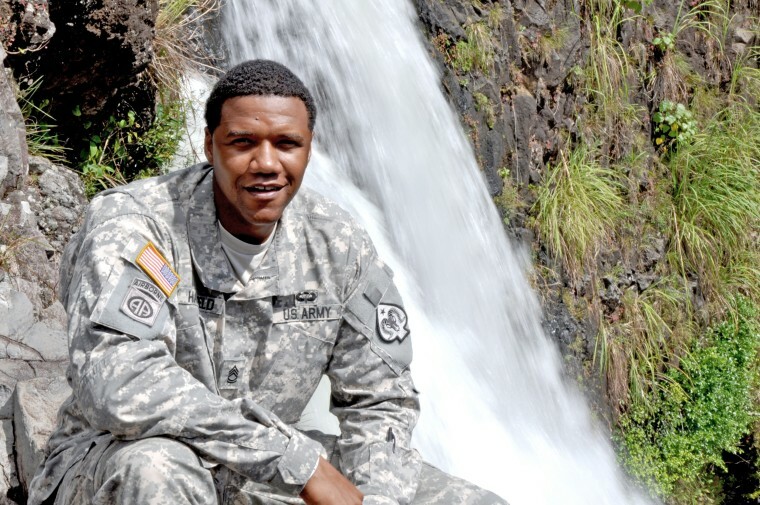 Hartfield, who served in Iraq with the Nevada Army National Guard, was remembered as a kind man with a giving spirit who “poured out love” to those who knew him. A family friend whose sister and niece were struck with cancer recalled how Hartfield stepped up to be there for her family. When her niece was too sick with chemotherapy to attend her high school homecoming, he helped organize a surprise homecoming party just for her. When she began losing her hair through treatment, he took her to his barber to get a haircut. He was "that" guy, said the friend, who asked not to be identified. “The healing process may take a long time but I know it’s something that we can start, and hopefully his family will be able to rebound from this,” said Rhett. Those calls, the kind that stick, are a consequence of police work, a consequence officers like Hartfield, an 11-year veteran, know all too well. In 2010, Hartfield helped design a memorial wall to fallen Las Vegas officers inside the Southeast Area Command precinct where he worked. There had been a particularly deadly stretch for Vegas police, in which four officers were killed in the line of duty in 2009, which became the department’s bloodiest year. In an interview with now defunct television station KTUD that year, Hartfield put the life-and-death nature of police work in stark relief. “Each officer paid a sacrifice in their own way, whether it was a traffic fatality or they died in the line of duty," Hartfield told the station. "I just thought it was important that it was remembered." During a late-night news conference on Tuesday, Undersheriff Kevin McMahill, second in command of the Las Vegas Metropolitan Police Department, choked back tears as he spoke of Hartfield's death and the family he leaves behind.